Vitamin D (a.k.a. the “sunshine vitamin”) is an essential nutrient for your overall health and wellness. Not only does it help your body absorb calcium, but this leads to many other health benefits (e.g. improving the function of your bones, brain, cardiovascular and immune systems, intestines, muscles and pancreas). Unfortunately, about 50% of the world’s population is deficient though. NCBI also believes that to prevent chronic disease, we may need even more of this essential nutrient than is currently recommended. So, while we typically absorb it through our skin when exposed to sunlight, we need to find other ways to boost our intake. Exposure to sunlight is still the most effective way to get your body’s daily requirements of this vitamin. This is especially true of midday sun exposure because this is when the sun is at its highest point and also when your body is able to manufacture it most efficiently. All you need is 10 – 15 minutes of unprotected sun exposure at this time of the day to your abdomen, arms, back and legs to meet your daily needs. However, it’s important to make sure that you practice “sensible sun exposure” so you don’t risk developing melanoma or other skin cancers. To do this one of the biggest things you must avoid is getting a sun burn by protecting the most sun-exposed parts of your body (e.g. your face and the top of your ears) and never spending more than 15 minutes in the sun without the proper protection (e.g. SPF-30 and a protective hat). 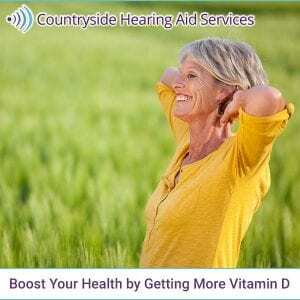 Countryside Hearing Aid Services says that one of the biggest reasons that getting sun and consuming the right foods is so important is so that you don’t develop osteopenia – a condition caused by deficiencies in this vitamin that can potentially contribute to hearing loss. If you or someone you love is suffering from any hearing issues, contact them today. They may be able to tell you that all you need is a little more Vitamin D in your life.